I was attracted to TaraShea Nesbit’s debut as much for its location as for its subject. My attention’s snagged by anything set against the stunning landscape of the American Southwest – recommendations gratefully received. It looked like it might be a handy antidote to the cerebral Orfeo but turned out to be very much more than the slightly fluffy novel I thought it might be. 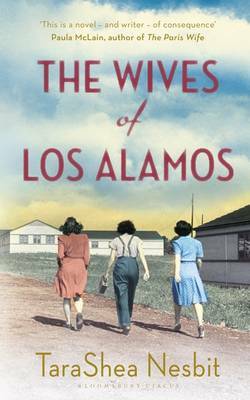 Opening in 1943 it’s about the wives of the scientists who worked on the Manhattan Project – the three-year development of the atomic bomb – deep in the New Mexican desert far away from their homes, friends and families. I’d expected a straightforward linear narrative exploring how the wives coped with their new lives while their husbands worked on the weapon which wreaked such devastation on Japan, not once but twice, ending the final phase of the Second World War but Nesbitt takes a much more unconventional approach writing her novel in the first person plural and dividing it into chapters of a page or two made up of short paragraphs. A pretty daring structure for a first novel and at first I found it a little tricksy but somehow Nesbit brings it off using the technique to emphasise both the diversity of these women who came from all over the world and the universality of their experience. These were women who’d had lives of their own – some with prestigious jobs, some not so, others were housewives – now plunged into isolation and secrecy. Some had children, others did not, and some became pregnant while there. They were faced with the loneliness of separation, constricted lives – they had to get passes to go as far as Santa Fe – the absorption of their husbands in work that they were not permitted to know anything about and the increasing distance this opened up in their marriages. They were not allowed to tell anyone where they were and could only go home for weddings and funerals where they couldn’t discuss their lives. Friendships formed, affairs were had, gossip was enjoyed, marriages broken. Water shortages, poor food and a challenging climate had to be endured. Then there was the aftermath: psychological problems, health problems – many of the scientists exposed to radiation died from cancer – guilt, the accusations of their children and of others. All of this is powerfully conveyed in what feels like testament. It’s a highly accomplished first novel and I’ll be on the lookout for Nesbit’s next. Several of the novels I’ve read this year have turned their backs on good old-fashioned linear narrative, most notably Siri Hustvedt’s The Blazing World and Jenny Ofill’s Dept. of Speculation. I usually start out uneasy with it but often become converted as I did with The Wives of Los Alamos. How do you feel about unconventional structures? Are there books that have converted you to them? If so, let me know which ones worked for you. This entry was posted in Reviews and tagged American fiction, Bloomsbury Books, Los Alamos, Manhattan Project, TaraShea Nesbit, The Wives of Los Alamos on 2 May 2014 by Susan Osborne.